This easy Whole30 meal plan for beginners makes it simple to eat healthy whole foods all week long. The Whole30 diet (the stricter sister of the Paleo diet) has climbed its way to one of the top spots for popular diet trends, promising benefits like weight loss, increased energy levels and relief from chronic pain and digestive issues—so long as you faithfully follow the strict set of rules for what you can and cannot eat. Even though it's not totally in line with all of our principles of healthy eating—you don't have to give up beans and whole grains in our book—the Whole30 diet plan does have some components we agree with. Whole30 followers are encouraged to choose whole foods with real ingredients, cut out added sugar completely, and read nutrition labels carefully—all sound advice for a healthy diet. But the plan also calls to eliminate all types of dairy, legumes, and grains (including healthy whole grains like oats and quinoa), which are all healthy foods that provide beneficial nutrients, like calcium, vitamin D and fiber. Research shows that unless you have an allergy, there is no reason to exclude these foods from your diet, and doing so actually causes more harm than good. While we're not super-fans of the Whole30 diet, we definitely identify with the healthy points. If you've been inspired to "hit reset" on your diet, rather than go full Whole30, we suggest taking a more balanced approach. The recipes in this 7-day dinner plan meet Whole30 criteria and feature simple whole foods and no added sugar. To help you get the full range of nutrients you need each day, we include healthy breakfast and lunch recipes that use hearty whole grains, calcium-rich dairy and fiber-packed legumes. This easy Whole30 meal plan makes it simple to eat healthy whole foods all week long. 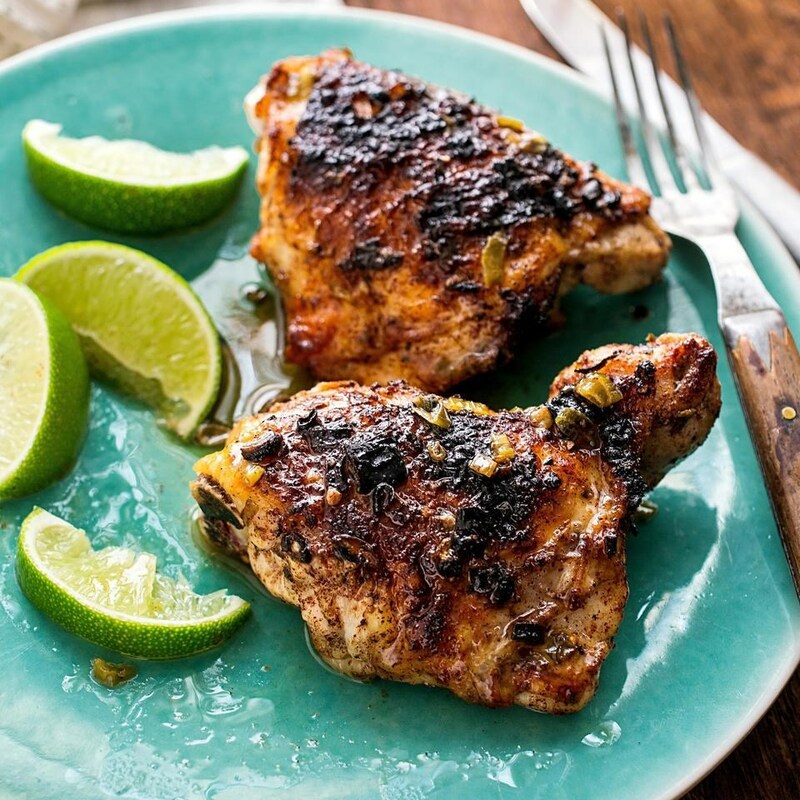 Broiled Ginger-Lime Chicken: Flavored with cinnamon, nutmeg, ginger and lime, the marinade in this healthy recipe yields juicy, tender, lip-smacking-good chicken thighs. Serve this tangy chicken with Cauliflower Rice and a leafy-green salad dressed with olive oil, lime juice and a pinch each of salt and pepper. Try the Chickpea & Potato Hash for a satisfying breakfast, and for lunch, the easy Tuna & White Bean Salad over leafy greens. 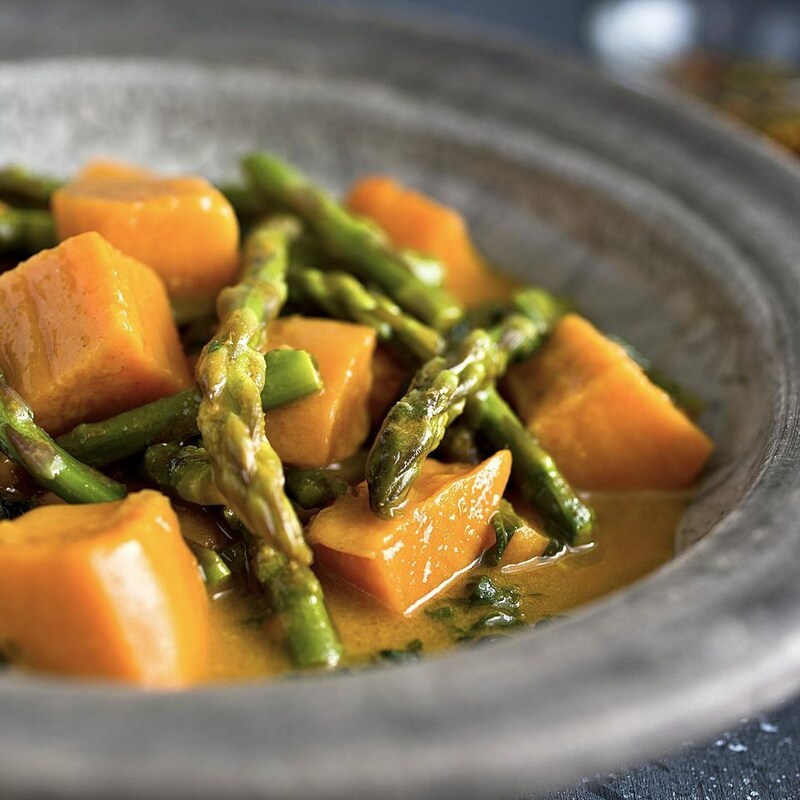 Vegetarian Thai Red Curry: This healthy vegetarian Thai red curry recipe matches sweet potatoes with fresh greens and asparagus, for a deeply-flavored dinner. Classic Thai red curry uses lime leaves and Thai basil—if you can find them definitely use them, but if you can't this curry will still be delicious. Serve with a leafy green salad dressed with olive oil and lime juice and topped with Curried Cashews. For breakfast, try the Apple-Peanut Butter Smoothie and skip the optional honey in this recipe—the natural sweetness from the apple is just right. For lunch, the Kale Salad with Spiced Tofu & Chickpeas get a nice crunch from roasted chickpeas. 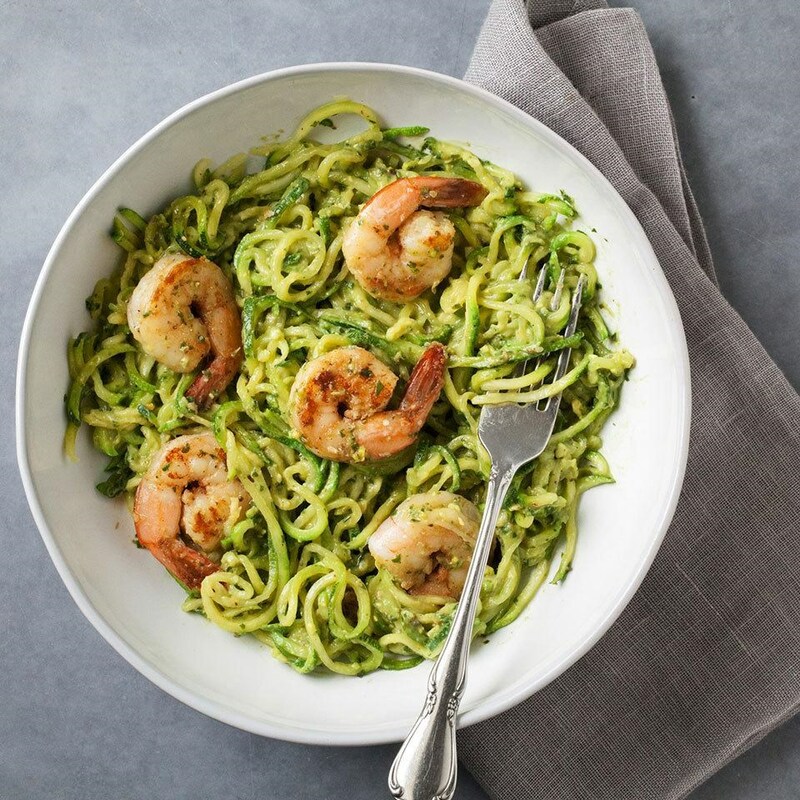 Zucchini Noodles with Avocado Pesto & Shrimp: Whole30-friendly spiralized zucchini takes the place of noodles in this zesty pesto pasta dish recipe. Top the zoodles with Cajun-seasoned shrimp to complete this quick, easy and satisfying dinner. For breakfast, try the Avocado Toast with Egg, Arugula & Bacon on sprouted-grain bread, which is made without added sugars. For lunch, the no-cook Black Bean & Mango Salad makes for a colorful meal. 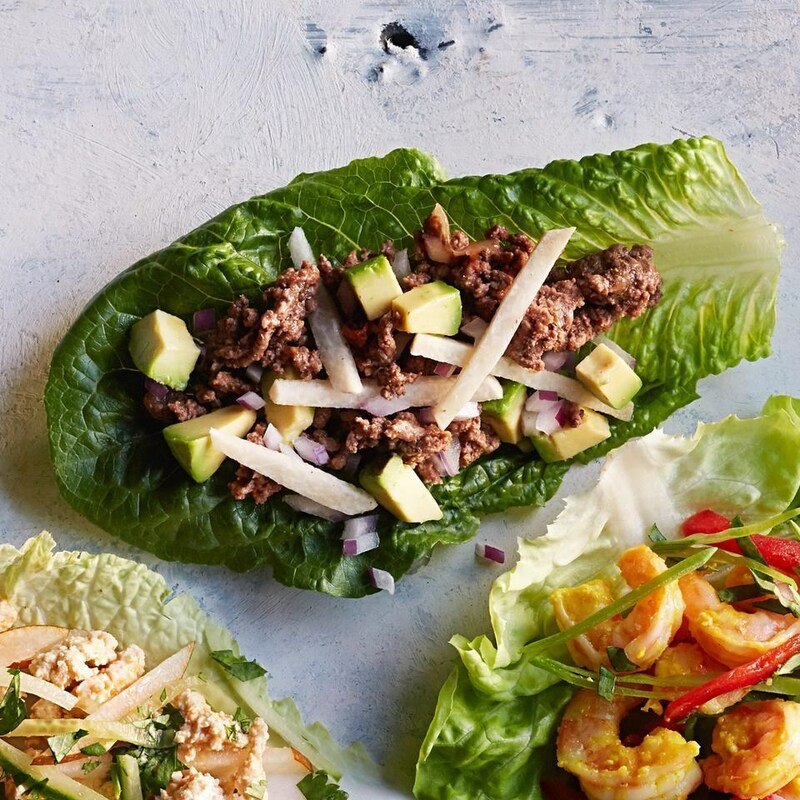 Taco Lettuce Wraps: Don't limit yourself to just romaine for this taco lettuce wrap recipe—any fresh green sturdy enough to wrap around ½ cup of filling works. Try Boston bibb, cabbage, lacinato kale or iceberg as an alternative. Serve with the crisp Sweet Potato & Cabbage Slaw. For breakfast, try the fruity Vegan Smoothie Bowl, and for lunch the quick-cooking Ravioli & Vegetable Soup. 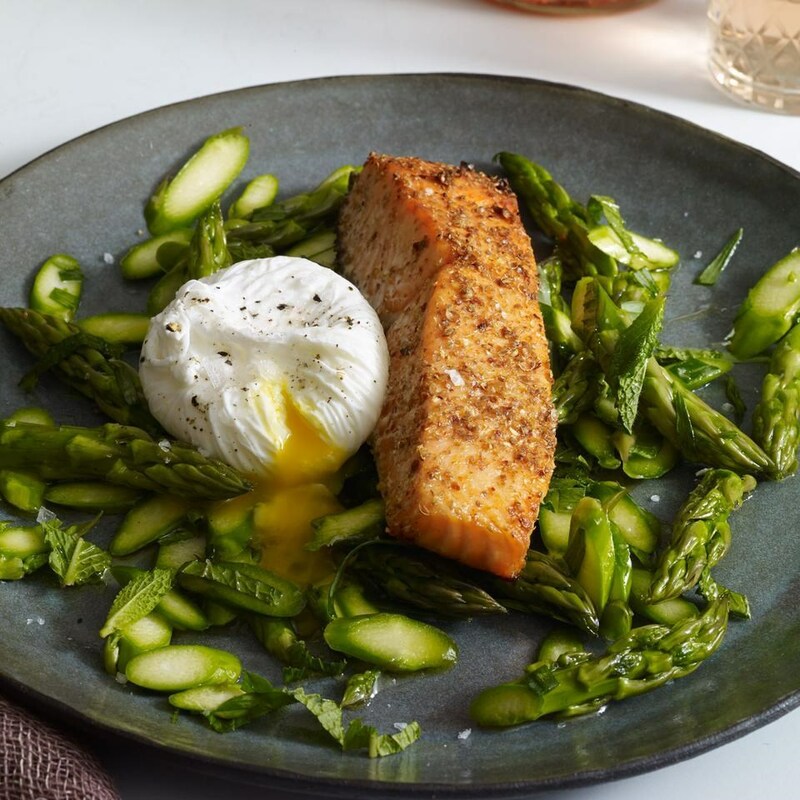 Coriander-&-Lemon-Crusted Salmon with Asparagus Salad & Poached Egg: Crushed coriander seeds and lemon zest give this healthy salmon recipe complex flavor that pairs beautifully with a shaved asparagus and poached egg salad. For breakfast, the Quinoa & Chia Oatmeal will warm you up and keep you feeling full till lunch. The Mexican Pasta Salad with Creamy Avocado Dressing holds up well in the fridge and is a great make-ahead lunch for work. 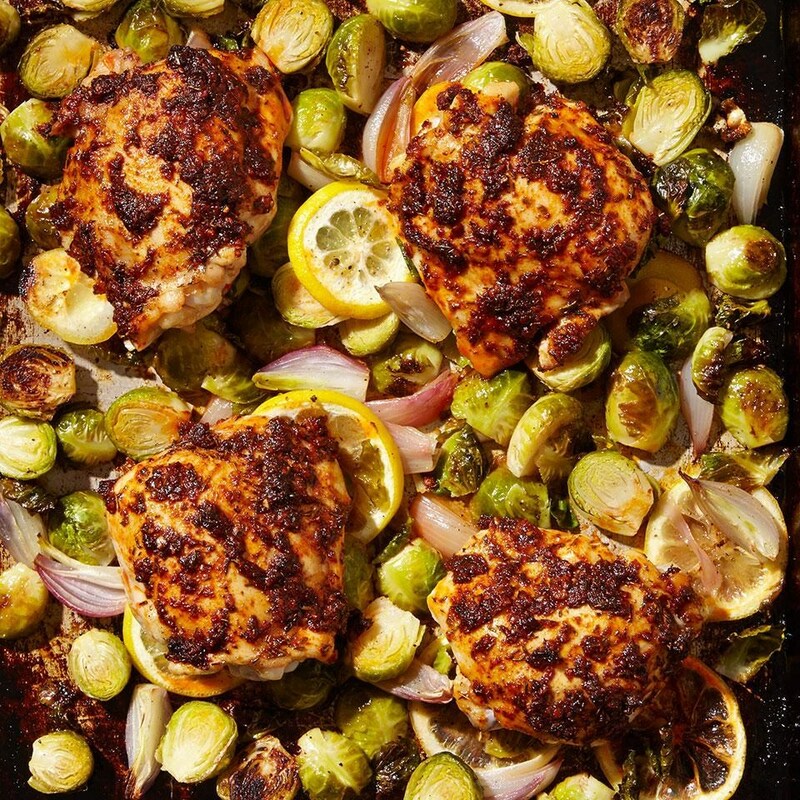 Paprika Chicken Thighs with Brussels Sprouts: In this healthy chicken recipe, paprika-rubbed chicken thighs are nestled into Brussels sprouts and shallots and roasted on a sheet pan in the oven for a healthy one-pan dinner. We highly recommend using smoked paprika—the subtle smoky flavor sets this dish apart. If you can't find smoked paprika, regular will work. For breakfast, try the Avocado Green Smoothie, and for lunch, the Easy Vegetarian Chili. Freeze what you don't use of the chili and pull it out later for a quick dinner or premade lunch. 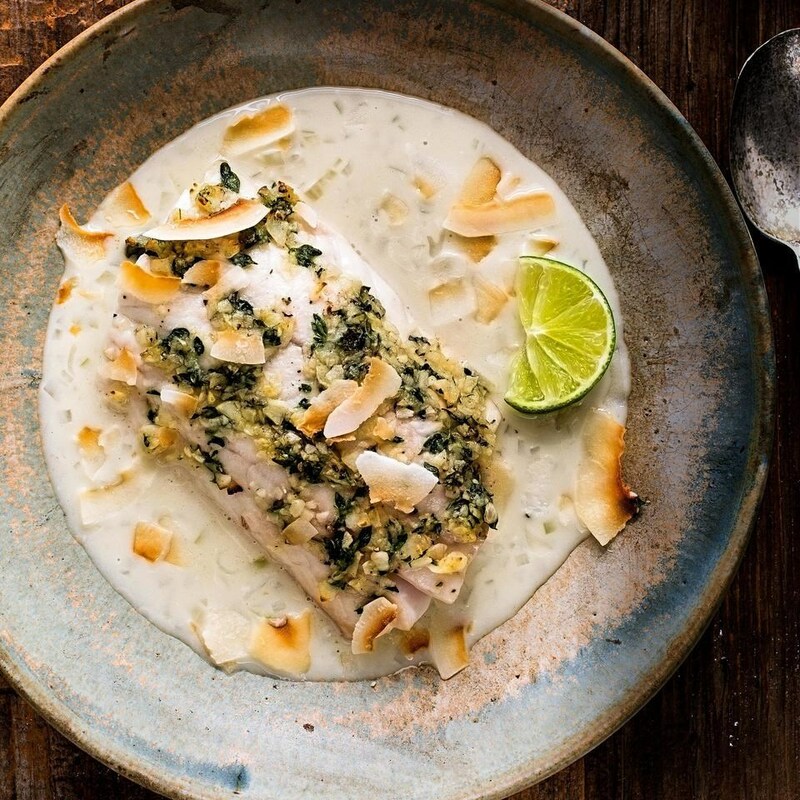 Fish with Coconut Shallot Sauce: This easy fish recipe with a flavorful garlic, thyme and coconut sauce is perfect for a healthy weeknight dinner. Serve with the Pineapple & Avocado Salad. For breakfast, try the Tomatillo Breakfast Tacos on corn tortillas, and for lunch the cheesy Kale & Gruyère Panini on sprouted-grain bread.